And as the golfers roll up to hole #5, the occupants of this yellow house on Chipshot Way have developed a little ritual for alerting each other to the pageant outside our windows. Whoever sees a group coming calls out "Garf Larbs!" My nephews oliver (L) and charlie (r) at the very vacation spot where 'garf larbs' was coined. their cousin name is choliver, by the way. now they are much much bigger than this, sigh. Either way, Charlie was duly impressed, if not terrified. He came running in to repeat again and again to each of us what he had learned about the fearsome forces that we could expect outside our windows. In his sweet two-year-old way, it came out "Garf larbs" - as in "There's gonna be garf larbs out there, we can't go!" Of course, when "garf larbs" entered our family lexicon, we had no idea we would soon be dwelling full time in the land of Garf (also known as the Land of Perpetual Mowing...) But, as long as fate has brought us to this spot, we have relished the opportunity to keep this little linguistic delight alive. The call of "Garf Larbs!" in our house might mean there are golfers approaching our hole, or that a golf cart is going by...we're not too picky about the referent, we just love the chance to feel the wonderfully twisted words on our tongues. So, what do Garf larbs have to do with meaning and mattering? Perhaps you have experienced those moments when you question whether your creative work matters? When you suddenly see your creative practice from an angle that is particularly hard-nosed or judgemental or grouchy or weary or blue and you say to yourself "but who even cares? it's not like anyone is waiting for this painting I'm making. It's not like my finishing this poem or not will make any difference. It's not like the world needs another novel, or workshop, or webinar, or memoir." And perhaps, not far beneath the surface of these defeating and defeated voices, you have felt an even darker set of existential fears lurking: "It's not like I'm needed or wanted. It's not like my voice matters. It's not like what I love is meaningful to anyone but me." And in the grip of these demons you feel supremely lonely and lost and deflated? Fear not! I'm here to suggest that "Garf Larbs!" might just be the incantation you need to manage those pesky moments of existential doubt. Next time you feel the meemies of meaninglessness starting to gather, shout out "Garf Larbs!" and I promise they will skittering back into the shadows. But here's the key to this system: while you speak the incantation, you must focus your minds' eye on the following thoughts and images. Picture golf itself - a pursuit involving the whacking of a small white ball with a metal stick in such a way that it will travel efficiently in the precise direction of a small hole in the ground. Now broaden your lens to see the entire international golf industry. Picture the gazillions of dollars spent on courses, clubs, carts, bags, tees, specially-dimpled balls, brightly colored polyester shirts, spiky shoes, how-to videos, golf-related art and decor, father's day joke books and even those little crocheted hats to cover the ends of the clubs. Picture the elite players who devote their entire lives to the sport, concentrating their whole existence on hitting those balls so consistently and precisely that they earn a place in history, enjoying corporate sponsors, millions in winnings, and occasionally even a special green jacket. Picture the millions of fans who watch golf on TV and the thousands of others who care enough to stand on the sidelines of tournatments on greens around the world, enduring sun and wind and regular shushings by officious volunteers in special vests, their hearts rising with hope of a glimpse of an elegant shot by a favorite player. Picture also the regular, everyday people who come out on a weekend to their local un-fancy, un-clubby golf course to play a few holes - old friends, fathers and sons, women and men, old and young - enjoying the sunshine and some time outside and the challenge of hitting those little balls into those little holes. As you speak your incantation while allowing images of the universe of golf to occupy your mind, ask yourself if it might just be possible that your project - your paintings, your novel, your poems - is as meaningful as golf. another great invention from the world of golf. I should acknowledge here that some of you may hold a certain distain for the Garf Larb world. 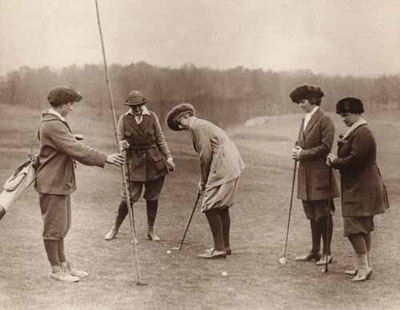 Perhaps you associate golf with its history of elitism, racism, and good-old-boy corporatism. You aren't wrong. But couldn't "The Arts" be equally held accountable for it's own histories of elitism, racism, and patronage by the wealthy? Or perhaps you're just saying to yourself "How would it possibly help me in moments of my own existential crisis to invoke images of something so patently meaniningless as golf?" Now surely your creative thing is at least that meaning-rich? Surely your creative thing puts you in a long lineage of others who have occupied themselves in this way over the course of history? Surely the very doing of your thing - at any level - grants you belonging in a community of others who find in what you do a source of beauty or truth or meaning, or all of the above? Surely it doesn't matter if everyone agrees with your choice to invest your thing with meaning - can it not be enough that you connect your thing to experiences of enjoyment, to values that you hold dear, to seen and unseen communities of like-hearted people who recognize what you are up to and understand what it means just to try? Consider the world of your creative Thing - the web of connections you are part of today and stretching back in time, the countless others who have felt your Thing had something to teach them if they just decided to practice at it and share the results. Decide that your Thing is probably at least as meaningful as Garf Larbs and matters at least enough to take your next step. Pull up your knickers and get to work!